We know that October means Halloween and Halloween means pumpkin. It seems like every autumn there are more pumpkin flavored treats - pumpkin spiced lattes, pumpkin pie, pumpkin cookies. 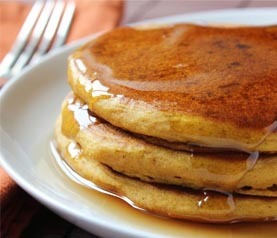 Now you can add pumpkin pancakes to the list! This recipe was sourced from allrecipes.com.